Preset constructions in your Minecraft cubic worlds. iHouse 1.7.10 is a mod that offers us a lot of houses and various structures that we put in our Minecraft worlds with a single click. So far, and in total, we will have up to 28 buildings already built, we can make it appear by simply right-clicking on the block containing the building. This mod is not as simple as crafting a block containing a house, but we gather all materials needed for building a kind of box construction. These boxes will use them to create the blocks containing buildings. Once crafted any building blocks, we only place where we are most interested in and right click on them. Among the 28 predefined structures we find diverse houses, warehouses, farms, stables, a cave house, camping tents, watchtowers, a castle, a glass dome and other buildings. 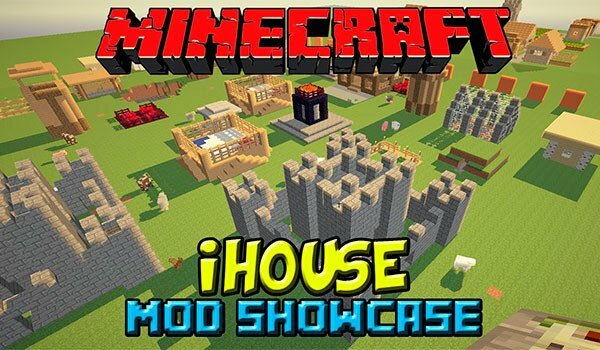 How to install iHouse Mod for Minecraft 1.7.10?